“Orange Juice Had A Good Run,” but now there is something better for you. Genesis Today, one of the country’s fastest growing juice brands and emerging leader in the superfood consumer category, is changing the perception of your morning glass of orange juice with a new line of superfruit juices. 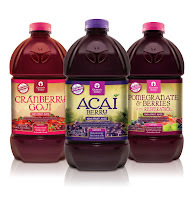 Now that these incredible Superfruit juices are available at Walmart, maybe it’s time you try them for yourself. “There is a shift in tide currently under way in the beverage market. This new beverage trend is all about the ‘halo of health’ around beverages with purpose – juices created with more antioxidants and vitamins than ever before and made with unique fruits and natural compounds like Acai, Goji berry and Resveratrol,” according to Dr. Lindsey Duncan, Founder & CEO of Genesis Today. Dr. Lindsey Duncan is a Naturopathic Doctor and Certified Nutritionist, who has been a trusted leader in the natural health products industry since 1983. After leading a successful nutrition practice in Santa Monica and logging over 40,000 hours of clinical experience, Dr. Lindsey wanted to do more. Dr. Lindsey has brought the superior, customized nutrition he had given his celebrity clients to everyone in America because he believes that no matter what your financial situation or your exercise routine, you deserve to be healthier, now. Every Genesis Today product is packed with so many nutrients, minerals and antioxidants that just one serving a day is all you need to start meeting your health goals. Genesis Today’s Superfruit juices are available in three flavors: Acai Berry, Cranberry Goji, and Pomegranate & Berries with Resveratrol. Genesis Today wants you to switch out your morning glass of orange juice for a healthier option. Try it now and feel the difference. ENTER TODAY FOR A HEALTHIER TOMORROW! Genesis Today will choose one lucky Grand Prize winner to receive the “Ask Dr. Lindsey – Prize Pack.” This will include a personal health consultation from Dr. Lindsey Duncan himself suited to your specific health and nutritional needs and will include a three (3) month supply of Genesis Today products – a $600 value. Second Place will receive a three (3) month supply of Genesis Today Superfruit juices, and 25 Runners up will receive a free bottle of Genesis Today Superfruit juices.